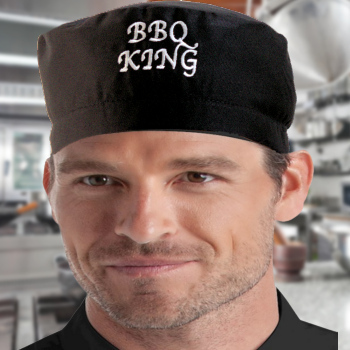 Quality professional chefs hat with fabric to repel spots and stains. Made from a cotton polyester mix. Perfect for chefs at home or in commercial kitchens, butchers, cooks. Fully machine washable for easy care and suitable for commercial laundry services. Amys Gifts can personalised this item with an embroidered name, initials of company name. A great promotional item for yourself or your business. Our pictured sample is a black skull cap with red initials sewn in a letter style called Blood of Dracula. Please use the options to type in the text you want and choose a thread colour and a letter style.